This is about an area of the world that remains, for those of us oriented primarily toward North America and Europe, a historically complicated and geographically confusing melange of ancient empires initially forged by warrior kings and their hordes on horseback, a parade of vast “-stans” marching eastward that are little understood and imperfectly located, wide-ranging and centuries-long religious and cultural and commercial conflicts, and names that are difficult to be immediately grasped, much less to remember. 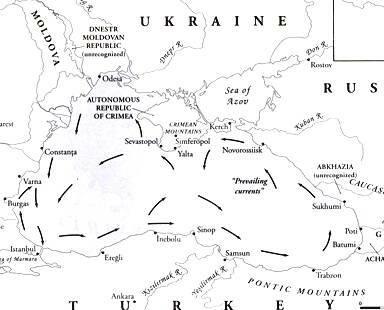 The stimulus for writing this overview comes from my reading of a fascinating book: The Black Sea: A History, by Charles King. 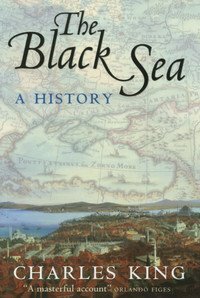 From this beginning the book shows us the flow of history in the region of the Black Sea, sweeping from south to north and back, and similarly east to west, but mostly from the east. The Empires of the Middle East, up to and including the Ottoman Turks, pushed north to control the sea and its assets: seafood, ports, shipping lanes, peoples. Many people of the North and West, especially Imperial Russia, pushed back and sought to overtake. Over time, as western European countries exerted powerful diplomatic, commercial and military power, the lake became neutralized. Throughout all centuries there were recurring waves of conquerors, and continuing influxes of migrants, usually pastoral people fleeing the east. 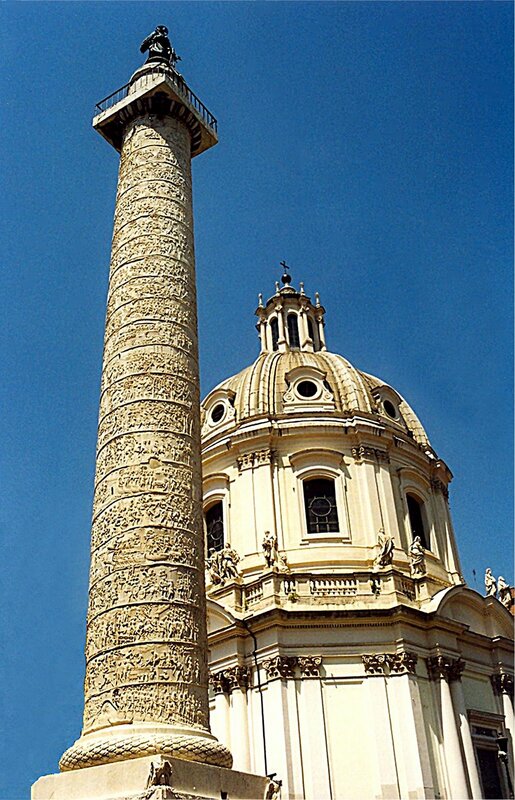 .To this day small and large ethnic and religious groupings of ancient peoples continue to exist throughout Europe and Asia in this region, even if their individual genetic heritages may have been infused with those of neighboring and invading tribes over the millennia. This is what makes the notion of country or nation so difficult in this area. Up until recently, for instance, to be “Greek” was not necessarily even to be ethnically or genetically Greek, but to belong to the Eastern Orthodox religion, no matter where one lived. The geography and physical characteristics of the Sea and its tributaries are also important, of course. 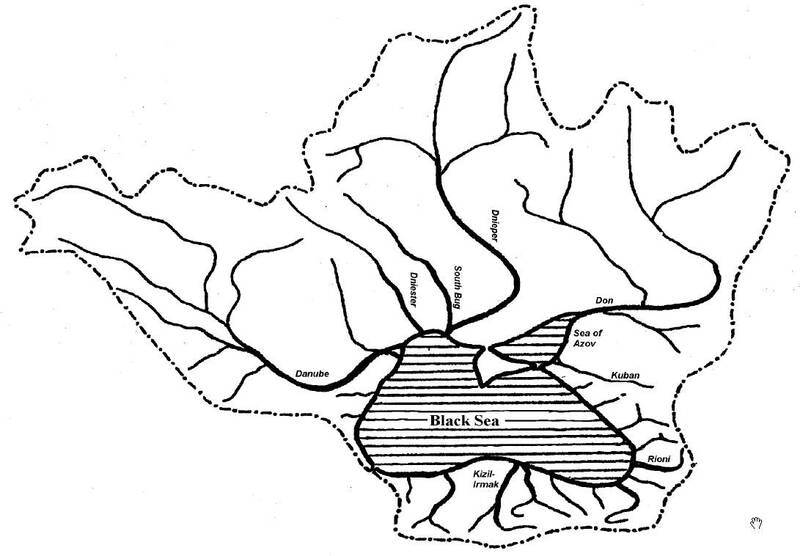 Here are the major rivers supplying the fresh water, the top layer of this great sea. And, yes, you read it right that the top layer of the Black Sea is fresh, while the bottom (and dead) layer is colder salt water from the Mediterranean Sea, flowing through the Bosporus. Another important feature of the sea is that is two or, perhaps, three seas in one. As you can see from the above, there are two counter-clockwise surface currents in the left and right portions of the lake which make navigation between them sometimes difficult. The Sea of Azov is a smaller and distinct body, as well. 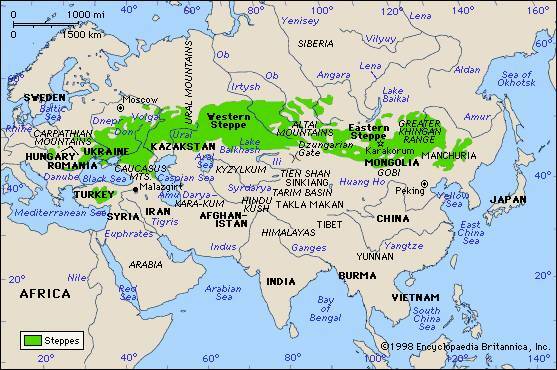 A salient aspect of the larger region within which the Black Sea is located, is a great prairie stretching from China through Southern Europe through which the “Golden Horde” and other eastern pastoral people gained access to the west. These prairies are called “steppes” and are celebrated in stories and music, presaging the “old west” legends of the prairie in North America. In addition, I have now gained an interest in looking also at the great salt water sea (or lake) to the east, The Caspian Sea, and a further look at the nature and history of the Steppes of Central Asia.What great dividends from the purchase of a single book!Many thanks, and my admiration of the author’s scholarship and writing skills, to Charles King. This entry was posted in Geography, History and tagged Black Sea: A History, Byzantine Empire, Charles King, Danube, Fall of Constantinople, Herodotus, Mongols, Russian Empire, Steppes of Central Asia, The Caliphate. Bookmark the permalink. Glad you like. Thanks for the comment.